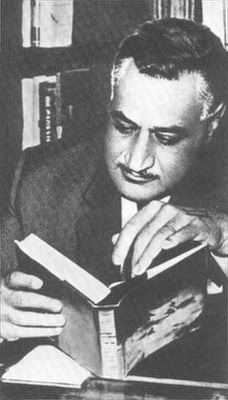 Gamal Abdel Nasser was President of 1956 until his death in 1970. Nasser had first risen to prominence when a Colonel in the Egyptian Army, he had planned the 1952 Egyptian Revolution which had overthrown the monarchy of King Farouk I. Operation Musketeer (French: French: Opération Mousquetaire) was the codename for the Anglo-French invasion of the Suez Canal zone. The attack followed the decision by Egyptian President Gamal Abdel Nasser to nationalize the Suez Canal. He made this decision after Britain and the United States had refused to fund the construction of the Aswan Dam. Between October 22nd and October 24th, the British and French held a secret meeting with the Israelis at Sévres near Paris. At this meeting, the parties agreed the Protocol of Sévres, whereby Israel would launch an invasion of the Sinai, and then Britain and France would demand both parties cease fighting and that Egypt accept an Anglo-French occupation of the Canal Zone to separate the Israelis and Egyptians. Although intended to be kept secret, reports of this arrangement leaked wihin deays. Israel launched her attack on Egypt (Operation Kadesh) on October 29th. On October 30th, Britain and France issued an ultimatum to both sides to withdraw from the Canal Zone. Britain and France began a bombing campaign on October 31st. Nasser responded to the Anglo-French ultimatum by sinking 40 ships in the Canal, and thus closing it to shipping. Both American and Soviet draft resolutions at the UN Security Council calling for Israel to withdraw to established armistice lines were vetoed by Britain and France. However the UN General Assembly did vote for US-sponsored resolution. Worldwide diplomatic pressure on Britain, protests both in the UK and abroad, an oil embargo by Saudi Arabia, Soviet threats of military intervention, and finally financial pressure on Britain by the US, were all applied. Despite military success, the pressure on Britain was too much, and the British Prime Minister Sir Anthony Eden announced a ceasefire on November 6th (without informing France or Israel beforehand).